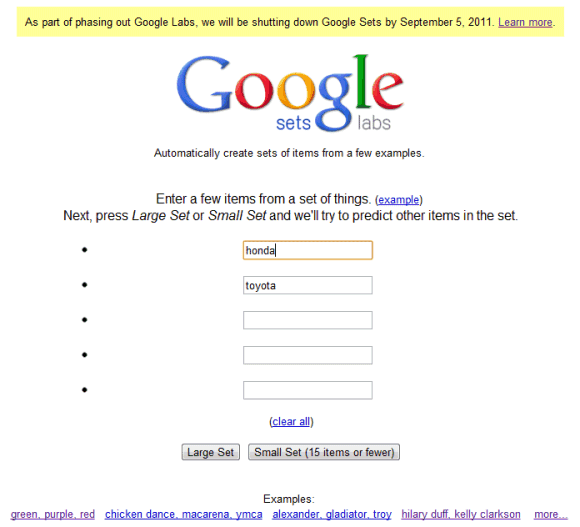 Google Sets, one of my favorite Google Labs experiments, will be shut down on September 5, just like Google Squared. Launched in 2002, Google Sets is the only experiment from the early days of Google Labs that’s still available, even though it hasn’t graduated. The great thing about Google Sets is that it only did one thing and did it very well: automatically generating lists from a few examples. Google Sets used the explicit and implicit lists from the pages indexed by Google and tried to find the lists that were relevant to the examples entered by users. 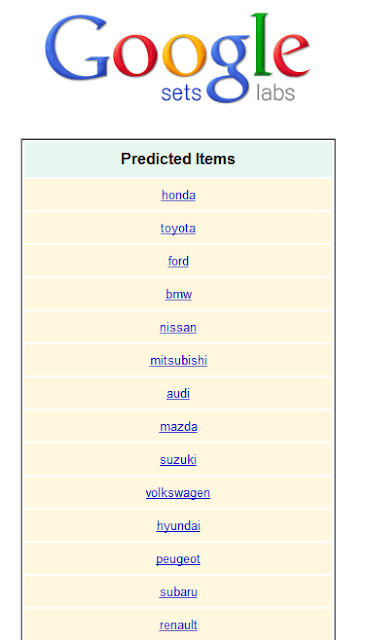 For example, you could enter “Honda” and “Toyota” and Google Sets returned a long list of car brands. The patent filed in 2003 explains that, at that time, there wasn’t any “mechanism for quickly and efficiently generating lists of items given one or more example”. Web pages included a lot of lists: some of them were created using special HTML tags (<ul>, <ol>, document headers), others used tables, while most of them were items separated by commas or tabs. The patent was filed by Simon Tong, a researcher who contributed to Google’s ranking algorithm, designed AdSense’s targeting algorithm and Gmail’s spam detection’s learning algorithm, and Jeff Dean, who designed Google’s crawling, indexing, and query serving systems, BigTable and MapReduce, the initial version of Google’s advertising serving system and a lot more. Google Sets was the building block for Google Squared, a service that generated lists and information about the items. If you type “dogs” in Google Squared, you’ll see a list of dog breeds, related images, descriptions, the size and the country of origin. The list of dog breeds is now also displayed at the bottom of Google’s results page for [dogs]. The attributes aren’t yet available in Google Search, but this feature will probably added in the future. While Google Sets and Google Squared will no longer be available, they’re still used in Google Search to better understand the content of a page and to provide lists of related searches.